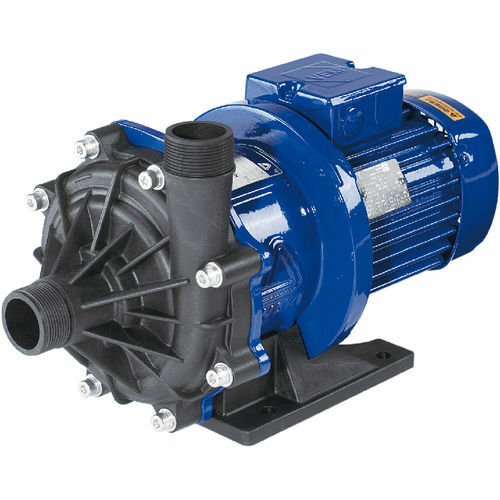 The MX series represents the latest state of the art design in plastic magnetic drive pumps to meet the most severe of operating conditions. When fitted with a carbon bearing the MX will allow for brief periods of dry running. The new “self-radiating structure” (PAT.) in addition to the existing proven non-contact principle and front and rear supported spindle greatly improves the pump ability to withstand some cavitation and running against closed discharge valve. Our innovative design has achieved higher efficiency. MX series pumps are highly recommended for use in various production processes such as filtering, spraying, washing and etching in surface treatment processes. The MX series is the first resin magnet pump which uses the pump casing divided into the front casing and the rear casing to form a vortex chamber as an ideal form. Therefore, the internal leak phenomenon, which means that the liquid getting out of the impeller returns to the pump casing and is suppressed to a minimum and the liquid is efficiently guided to the discharge port to enhance overall efficiency. Through heat-dispersion holes provided in the fixed portions of the impeller and the magnet capsule, the liquid around the spindle and the bearing is forced to circulate so that heat generated by sliding can be reduced effectively. Thus, thermal deformation and melt are prevented.